I write this as a general update for all those who support PCE Foundation students, from the Nursery section of the Portland school all the way up to the University/college level. 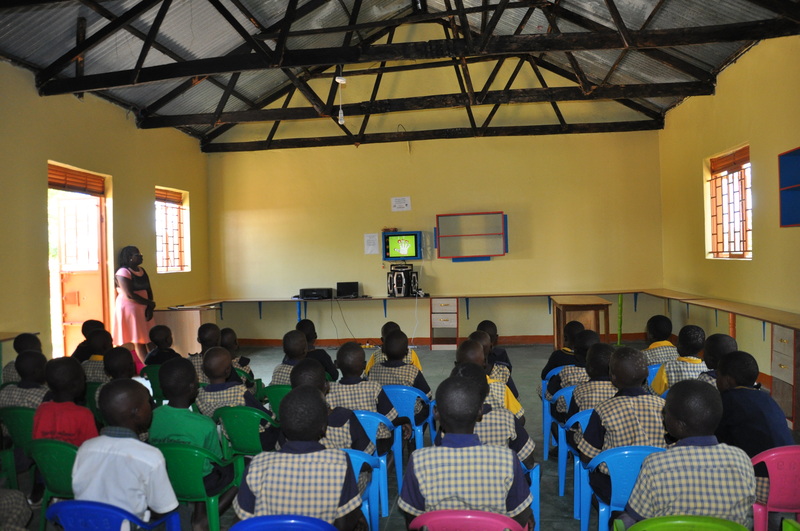 Portland school is now complete, and provides educational opportunities from baby class to primary seven. You can find details of the Ugandan education system on the Where We Work page of our website. The children have already sat for their beginning of term examination, and their head teacher has said that their performance is promising. We have over 150 children without sponsors at the Portland school. These children eat at school, every school day. Their teachers and administrators are paid, some are housed and cared for, within the school. We appreciate the 22 sponsors of 22 children in the Portland school, you are giving these children a strong foundation. They are in the right hands and learning in a great environment. We are proud to inform you that Portland School now owns a digital classroom where educational television programs, typing and printing services as well as lighting for all 13 classrooms are now available. We are currently creating ways of improving the learning abilities of the students through use of technology. We believe that use of especially a television with educational programs that match the curriculum and processing tests and assessments will further improve the vocabulary of the children. We are very grateful to Richard Carss for sponsoring this project! We are looking for sponsors. In St.Noa girls school alone, we have 23 girls without sponsors, in standard high school we have 12 students without sponsors, 2 students in the nursing school and one student in the primary teaching college. If you know anyone who could sponsor or contribute small donations to support these students and children in school, please help spread the word. We are happy to inform you that all 8 of our RGCM students are deeply invested in their nursing career studies. They have all gained practical experience in hospitals, including delivering babies, testing for and treating malaria, administering injections and more. Above all, they are very proud of their career choice and are working very hard to achieve their dreams. We have 3 students in Nyenga Nursing and Midwifery school and 5 students in Mityana Nursing and Midwifery school. 15 girls recently did interviews and all passed to enrol in Mityana nursing school, their classes start on May 2 and ends in December 2017. The current nurrsing students will get their two weeks holidays in early April. On March 6, fifteen of our students were accepted to the Mityana Nursing and Midwifery School after passing the written and oral interviews for new student intakes. They will be reporting for their first semester on May 2. The school requires that we pay at least 60% of the tuition fees per student by April 3, 2017. Since the nursing course is very competitive, a student who does not meet the deadline could be easily dismissed to make room for another one on the waiting list. We have no students entering the Nyenga Nursing and Midwifery School this year. The Buloba Primary Teachers’ college curriculum schedules are similar to those of the primary and secondary schools, with 3 terms a year. We have five students in this college this year. Of the 10 students enrolled last year, 5 have completed their courses and are waiting to graduate this year, along with 3 who completed in 2015. Unfortunately two students this year have not been allowed in college because of pregnancy. We are still negotiating with the college to allow them in the in-service school program, a program for students who are already teachers somewhere and are only training to be professionals. We have been told that this category allows for pregnant mothers to study. This program runs during school holidays and stretches to a period of 3 years unlike the full time one which runs for 2 years. Our college and university students are into their semester two classes. One student, Lazarus Othieno, is completing his course this May. Most of our students will complete their three year courses in May 2018. In total we now have 19 students in this category. The next semester after this starts in August. We are very grateful for all your support! From November 2016 through February 2017, there was a terrible drought. With no rain and high temperatures, crops died and the water wells dried up in the villages. People were using and drinking very dirty water that slowly dripped from drying swamps. These water sources were shared with animals. To help prevent this from happening in future droughts, Robin and Geoff donated the funds to build a well in Amor village. The well was manually dug during the height of the drought which allowed it to be dug very deep. By reaching water under those conditions, it should be plentiful during normal conditions. The total cost of the well, a 10 000-liter water tank, pump, generator, and 4 taps, as well as a celebration of the well’s completion, was US$3 000, and it will make a huge difference to the community. In addition to providing education to vulnerable students, with emphasis on the rural girls, we run other projects which include farming assistance to the community, micro-finance and preventive health initiatives. Now that the drought has ended, we are preparing to deliver the Christmas chickens to the families of the girls sponsored through RGCM. Many sponsors donated funds for the chicken project, but if you missed out, it’s not too late. Just donate the funds are quickly as possible and let us know they’re coming. The resources to purchase additional chickens would allow us to support the entire beneficiary community uniformly. Our mango and pineapple projects are doing well and have both been harvested twice now. We are also promoting beekeeping, vegetable growing and piggery projects. All are growing steadily. We are promoting organic farming whereby our fruits and vegetables are treated with natural remedies rather than chemicals. This approach is better for the environment, as well as our health. It is my great honor to inform you that we have won two grants this year. One is for a one day workshop, a Girl Empowerment Day workshop sponsored by the American Embassy, Kampala. The workshop was held on March 25, 2017, and its objectives were to equip 100 school going girls aged 14-16 with life skills (self-esteem, communication, leadership, problem solving, decision making skills), subjects and career choices, voluntarism approaches on issues surrounding a rural girl child, team building, and goal setting activities. It also addressed science, technology, engineering, and mathematics (STEM) in relation to girls education and to establish sustainable life skills structures through setting up Peer clubs within 20 rural schools in Tororo district. The day was wonderful, and a great success! The other is from AmplifyChange (https://amplifychange.org/about-us/) which will allow us to conduct a peer mentoring program on reproductive health rights. 103 of our our sponsored girls will each educate 10 girls within their respective villages. I have recently started taking care of Mercy, an infant whose mother Zerida died tragically, shortly after giving birth. Zerida was only 17; a mentally ill girl who had been raped by a group of men, and had no one to help her deliver her child. Thankfully Mercy is in good health and feeding well. I am so grateful to all who answered my call for help on Facebook. We are now searching for a caring family to adopt Mercy who can give her the bright future she deserves. We are currently working on our 2016 annual report. We will share it with you all soon. On behalf of the PCE Foundation, I wish you a peaceful month! So glad Kelly pointed this out. I couldn’t agree more. Beatrice, you are an amazing woman; an inspiring human being and a role model for many. Just the knowledge of caring, capable, and selfless people like you out there, (if rare), keeps the hope up. Partnering with you and your the Pearl Community Empower Foundation, under your leadership is an absolute honor for A More Balanced World….. Thank you so much for your kind words, Kelly and Mandy! We can not wait for your visit, Mandy! Partnering with you is one of our greatest achievements! although I dont know kelly and mandy- i agree 100% with them. You are amazing. I will have another 10 girls sponsered by the end of the year!